Taking inspiration from Grecian, Byzantine and a variety of other ancient jewelry styles to create contemporary pieces, the Athenian goldsmith Ilias Lalaounis has gifted the world with an appreciation for the venerable art of adornment. Lalaounis started working as an apprentice in his family’s jewelry company in 1940. In 1969, he decided to separate from the family business to start his own production. Focusing mainly on the fabrication of chains, Lalaounis would later introduce ancient Greek revival pieces to incredible success. The jewelry house achieves the international recognition that it was striving for when in the 1960’s, Aristotle Onassis started purchasing pieces for Maria Callas, as well as his later wife, Jacqueline Bouvier Kennedy. 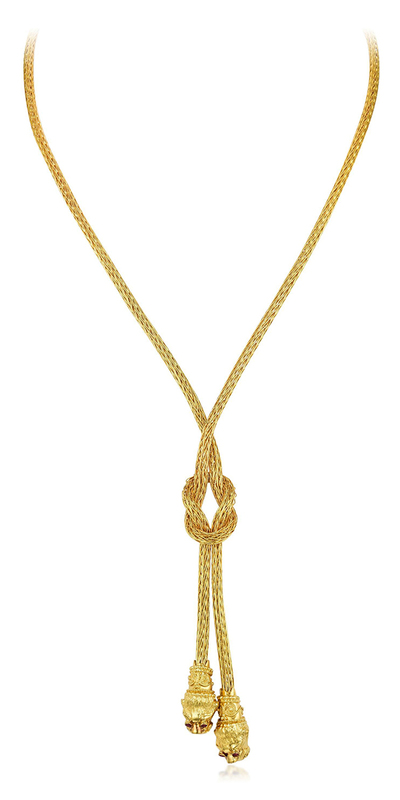 Lalaounis Gold Lariat (June Fine Jewels, Lot 206). Estimate $3500-$4500. An artist as well as a jeweler, Lalaounis explored the ancient jewels of his ancestors to breathe new life into forgotten crafts. He schooled his fellow craftsmen in the production of his pieces, using ancient techniques such as granulation, filigree, hand-weaving and hand-hammering to create pieces that are steeped in antiquity. His inexhaustible creativity and appreciation of antique crafts led him to be the first goldsmith to be honored by the Académie des Beaux-Arts et des Lettres, for his contribution to the art of jewelry. Ilias Lalaounis Gold and Sapphire Bull Brooch (June Fine Jewels, Lot 208). Estimate $2,000-$3,000. 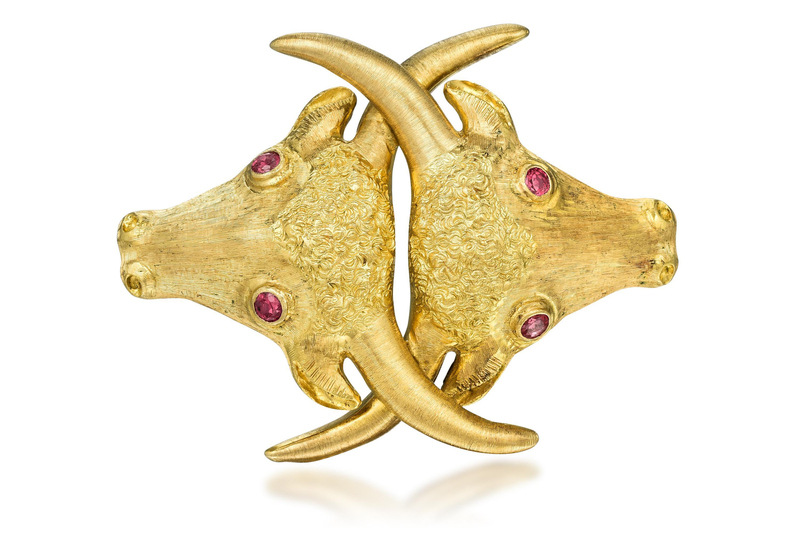 Fortuna Auction is excited to offer a desirable collection of Lalaounis’s iconic and fashionable pieces including an bold brooch featuring bull heads with interlocking horns and pink sapphire-set eyes, as well as a garnet ring with filigree details fit for a Roman empress. 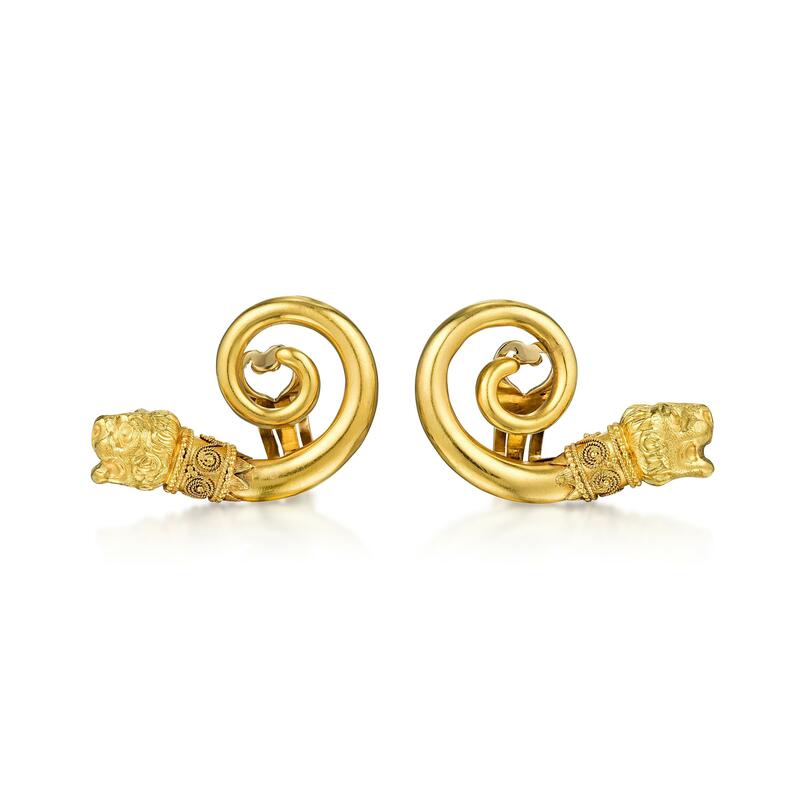 Click here to view all the Ilias Lalaounis jewelry offered in Fortuna’s upcoming June FINE JEWELS sale.